Hi all - it's Mona, here. Today, I'm going to share with you a review and giveaway for a lamp. a 5 foot folding table and a card table. On my folding table, I have my sewing machine, a cutting mat, and my portable ironing mat. It's a tight area, but it works for me. The only thing that doesn't really work for me is the lighting. We have a vaulted ceiling in our family room and skylight windows. The only lighting comes from a ceiling fan. I have a floor lamp near my sewing machine which helps some, but it's an old fluorescent-type and doesn't help a whole lot. I reached out to OttLite, a company that produces lamps that provide natural daylight indoors. 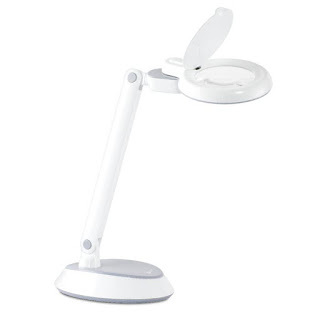 OttLite provided a Space-Saving LED Magnifier Desk Lamp to me for review. This particular lamp has an articulating arm and pivoting head. What does that mean? You'll be able to adjust the lamp to have light showing on the area you are working on. Also, there is a magnifier at the top of the lamp which allows you to get a closer view on intricate details. The lamp has been great in my work area. The increased lighting has helped so much - with cutting, sewing, and quilting. The lamp is small enough that is can sit on my folding table yet it doesn't take up a lot of room. I had the opportunity to use the magnifier recently, too. I am not a hand-binder for quilts. 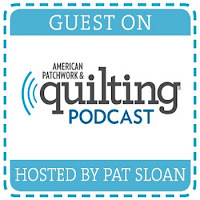 I usually machine-bind all of my quilts. However, I was working on a mini quilt for a contest and thought I would give hand-binding a try. Well, the mini was black with black binding and I was using black thread! 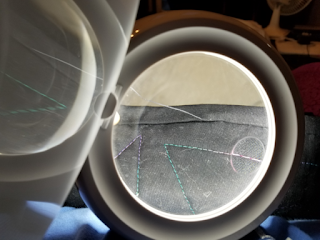 Because the lamp is fairly compact and light-weight, I was able to have it next to me on the recliner and use the magnifier to see what I was stitching (see the picture below, but please ignore all of the lint!). I honestly don't know if I would have made it through without the lamp. These lamps are available directly from OttLite. You can also purchase them at Joann's and Ottlite Lamps on Amazon as well as other retailers. Thank you, OttLite, for sending me the lamp to check out. Rules: the winner must be 18 yrs of age or older and live in the US or Canada (excluding Quebec). Not affiliated with Facebook, Instagram, or any other social media entity. While I have been given this lamp for review, all opinions are mine. I could always use better lighting at my cutting table and for quilting! This would help immensely! Would love to have better lighting in my little studeo! I could definitely use this. I have poor lighting and the magnifier would be a great help since I have some seeing problems. I need more lighting in my sewing room and this would be perfect!!! I need this! I have such bad low light vision! Yes I definitely need more light to sew with. I have decreased vision in one eye so this makes everything sewing related a challenge without lots of light. So much of my sewing time is early morning or late evening. And thr magnification would comr in handy when I hand stitch details on doft sculptures. This would be so helpful!